PA Chairman condemns Jewish communities in Judea and Samaria as "ethnic cleansing", asks UN General Assembly to recognize "Palestine". Palestinian Authority Chairman Mahmoud Abbas sought a new super observer UN status Thursday and condemned Jewish communities in Judea and Samaria as "ethnic cleansing." One year after his bid for full membership at the United Nations Security Council, Abbas returned to the UN General Assembly to warn that Israel's tactics were a sign that it "rejects the two-state solution," AFP reported. He called on the Security Council to pass a binding resolution setting out a path to end the two-year deadlock in peace talks between Israel and the PA.
Abbas said he would seek a vote at the UN General Assembly in the coming months to approve Palestine as a "non-member state of the United Nations." "We are confident that the vast majority of the countries of the world support our endeavor, aimed at salvaging the chances for a just peace," Abbas said. “Developments over the past year have confirmed what we have persistently drawn attention to and warned of: the catastrophic danger of the racist Israeli settlement of our country, Palestine," Abbas said, lashing out at what he termed "attacks by terrorist militias of Israeli settlers." He said new Jewish communities and in and around Jerusalem and demolition of “Palestinian homes” are "a campaign of ethnic cleansing against the Palestinian people." He did not mention that any Jew who enters a PA village takes his life into his hands and that he has announced repeatedly that no Jews would be allowed to live in a PA state. And although Arabs do not live in Jewish towns and vice-versa, many Arab workers earn their livings in Jewish towns, whereas no Jew could work in an Arab community and remain alive. "We are facing relentless waves of attacks against our people, our mosques, churches and monasteries, and our homes and schools," Abbas said. "They are unleashing their venom against our trees, fields, crops and properties, and our people have become fixed targets for acts of killing and abuse with the complete collusion of the occupying forces and the Israeli government." He did not mention how PA terrorists murder Jews, such as the Fogel famiy, steal livestock and destroy property. Abbas said Israel's tactics could only lead to the conclusion "that the Israeli government rejects the two-state solution." He called on the Security Council to "urgently adopt a resolution comprising the basis and foundations for a solution to the Palestinian-Israeli conflict that would serve as a binding reference and guide for all." He said such a move was crucial if the state solution "is to survive and if peace is to prevail in the land of peace." He did not mention that he refused to negotiate with Israel, breaking off talks with one pretext after another, and that unilateral statehood declaration means no peace. Abbas’ bid last year failed due to a lack of support in the 15-member Security Council. 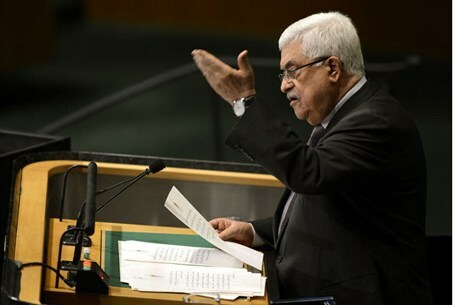 However, PA Foreign Minister Riyad al-Malki has predicted that Arab countries support a unilateral PA bid for statehood recognition in the UN General Assembly. The PA is close to bankruptcy because his unilateral bid has stopped U.S. aid, which by law is predicated on his adhering to the Oslo Accords. The Obama administration has said it will oppose the PA’s renewed statehood bid at the UN and will “make the case” at the United Nations for Israeli- PA talks when Abbas submits it. Gaza's Hamas government, meanwhile, denounced the address by Abbas, also known as Abu Mazen, who heads the rival Fatah group. "We repeat that it would be better for Abu Mazen to proclaim the death of the negotiations and of compromise," said Taher al-Nunu, a spokesman for the Hamas government, who called Abbas's address "emotional." In his speech after Abbas, Prime Minister Binyamin Netanyahu responded that Israel wants "a durable peace with the Palestinians." "We won't solve our conflict with libelous speeches at the UN. That's not the way to solve them. We won't solve our conflict with unilateral declarations of statehood," he added. "We have to sit together, negotiate together and reach a mutual compromise in which a demilitarized Palestinian state recognizes the one and only Jewish state." Deputy Prime Minister Moshe Ya’alon also criticized Abbas’ speech, saying, “This is not a speech of peace, not a speech of reconciliation. This speech reflects the avoidance of Abbas from allowing negotiations with Israel as he avoided Olmert's offer and as the Palestinians have avoided in the past. Foreign Minister Avigdor Lieberman said Abbas’ speech because “was a blatant incitement speech which made it clear to all those who live in illusions and are lying to themselves about Abbas’ true intentions and where he is going.